The guys at Photo Rumors tested the new Canon EOS 7D Mark II and the DxOMark results are a bit haunting for Canon users. 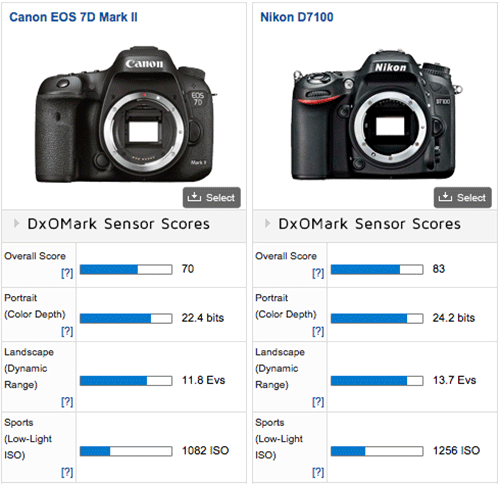 In the comparison charts below they found the highly anticipated Canon EOS 7D Mark II tests similar to the five year old Nikon 300s. Has Canon hit a plateau in meaningful updates to push themselves ahead of the rest of the pack? With comparisons to five year old Nikon systems, it could be the case. Needless to say, having waited long enough for the highly rumored Canon EOS 7D Mark II, I was very excited to get my hands on the new Canon flagship crop sensor to see the major differences. Using the previous model for a few sporting events here locally it was nice to see updates in focus and speed though slight it was an upgrade. Being a Canon shooter from the start it has been a slow go at finding truly innovative jumps in bodies recently. Waiting for the next variation to only find its being compared to older Nikon or Sony bodies is discouraging and has kept me holding on to my older Canon gear even longer. 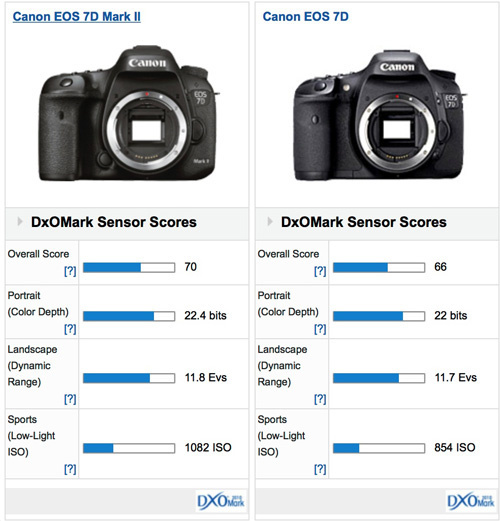 Below are some of the screen grab comparisons for the Canon EOS 7D Mark II. What do you think? 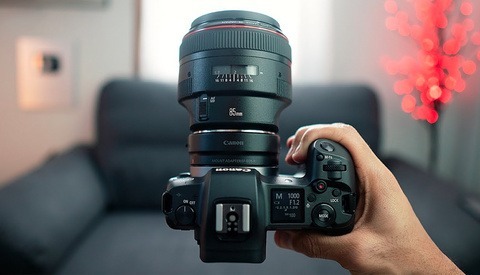 Have we seen a plateau in updates from Canon or camera bodies in general? Am I alone in thinking companies are taking after the Apple update scheme in releasing slight evolution steps rather than revolutionary steps as they seem to tote each year in marketing plans? I am also a canon shooter. I am jumping ship to shoot sony. I'm going to wait for the next gen A7r and I'm out canon! Right, actually looked at Sony cameras back a few years ago when I started to research a camera to get. Now they are blowing the competition away with its lineup. Gotta let me know what you think of the A7r for sure. I shoot everything on a tripod tethered so weight distribution isn't a problem for me. I made that jump, exactly, a year ago. I will never go back to big bodies. Sony is a hard ship to follow - thy keep changing everything too quickly, so much that it's irritating. But that A7r - my lord - what a diamond. Yea, I think that was my huge hesitation in grabbing a Sony a few years ago. It was the fact they were just starting in that class of camera and knew changes would be coming as they figured it all out. They seem to be on spot with quality and size though. Prices are a little higher than I was expecting but solid still. The entire methodology is flawed. 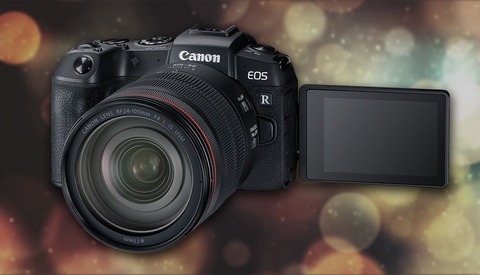 We already know that Canon has geared performance to be skewed toward higher ISO values. 160 on Canon was the base. Now it seems like the true base of this camera is 800 or so. Beyond that, some of the measurements have becom meaningless to the human senses. Nikon show 24-25 bits of color and 14-15 stops of dynamic range. Both of these values are BEYOND what most humans can perceive. It's a lot like Crayola making a box of 512 crayons. Who is going to realize with the human eye the difference in the four shades of blue-green? Canon has chosen to put the tech into making it easier to get a higher percentage of keepers is what I am guessing. I recently switched from Canon to Sony. It is notable to keep in mind that most rental houses don't carry Sony stuff. That turned out to be a bigger problem that I thought. You know I'm a Nikon shooter and even though this looks bad for Canon I still say if you're a Canon user go shoot and enjoy your Canon. Canon folks love their cameras and enjoy shooting them. If having something familiar means getting the shot then sensor quality is a bit of a second at least for myself. I think this DxO stuff is occupying too many people's time. I love Nikons and will continue to shoot Nikon because I'm used to and like the controls and also have a lot of great Nikon glass that I particularly like. I'd still shoot them even if they didn't have great sensors..and in fact I do...my D700 is still going strong. The point is shoot what feels good in your hands and what handles/shoots well. I think the sensor is many times secondary. This camera seems more aimed at sports users, and typically those environments are well lit, so I don't think the sensor will bee too much of detriment. That said, it's been obvious for quite a while that Canon's sensors have been lacking behind the Sony counterparts, and possibly others. They need to concentrate more on this area. I wish sports environments were well lit - maybe so on the TOP level. Curious, what particular sports environments are underlit that you need to go to those ISOs? For me - quite a few. I tend to cover lots of sports around Europe. But - the thing is that when I cover the games for newspapers, it is fine to go to those ISO levels and I rather have a grainy image of ISO8000, than lower by shutter speed to keep image clean but blur the action. Perhaps it just happens to be the sports I cover.. so can only speak from my own experience. Sports shooters will typically be shooting with long lenses, thus be needing a fast shutter speed, so high ISO can really help there too. 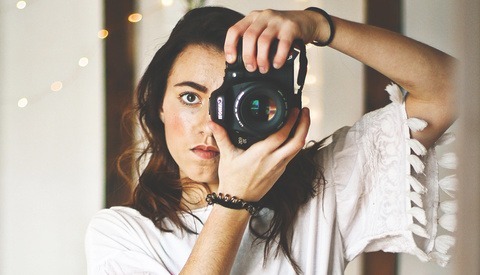 I seriously doubt that buying equipment based on a number will improve anyone's photography. If it does, then I am buying one of those Paint by Numbers kits, because I'm not much of a painter. True, but being in the profession and seeing the obvious limitations every photography reaches; low light situations, load speeds, shutter speed etc. Its tough to not look at the gear as your profession grows and think how can this tool I use be better for me to capture what I am imagining in my head. I'm still waiting to see evidence that doesn't suggest that DxOMark isn't sponsored by Nikon in some way. They beat out every camera according to their tests, including Sony cameras, who make Nikon's sensors. I've always felt Nikon and Canon are very on-par, or switching back and forth as the new high ends come out. Always had strange feelings toward DxO also. Low end Nikons beating out top-end competitors. Canons scores seeming to get worse and worse every year. 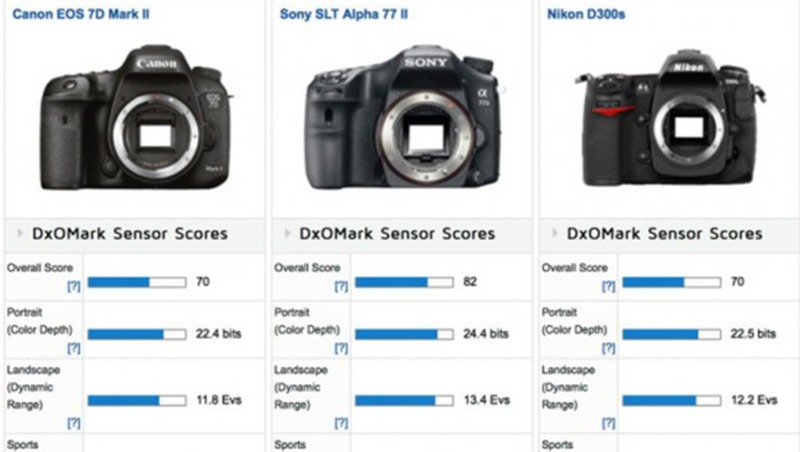 Nikon beating Sony while using Sony sensors. I'm sure if there was any actual substance to there scoring Nikon would have a much, much large market share by now, especially in the high end department. More transparency on DxOs methods would be nice because I haven't seen much about that, but then again I stopped going there pretty quickly. I agree that DxO results sometimes look weird. It also seems wrong to summarize one camera with just one score. That being said, even though Canon JPEGs are really good straight of the camera, Canon RAWs just don't have the same quantity of information as Nikon/Sony counterparts. You can save Nikon RAWs that are 5 stops underexposed and get very decent results. Anyway, there's much more to it than just RAW quality. Canon lenses are gorgeous, they didn't intentionally cripple their camera to force you buy a 6000$ camera, and they listened to their users asking for pro APS body. Finally, every Canon/Sony/Nikon/Fuji sensor has been good enough for 99.9% of the photographers, for a few years now. There was an article on Canon Rumors the other day saying Canon are going to continue to use their own sensors in their bodies. Would be interesting to see Canon use a Sony sensor in a upcoming body and how DXO rate it. Then you would know if they're being paid by Nikon. Canon already has used a Sony sensor with the PowerShot G7 X.
Yeah I know about them using it for the lower end cameras, but I was mainly referring to DSLR's. The high MP body that Canon are supposedly working on is rumoured to be using a Sony sensor. Quite possible, many of the medium format cameras are now using a Sony sensor. Ha! Who knows. I used Snapsort? Or something like that when I first started looking for a camera to compare and see price differences in my range. Though the 60D I have and shoot with was beat out by most Nikons I just thought the Canon felt good in the hand and I saw the ease of use was much better to flip through settings in a fast pace environment. 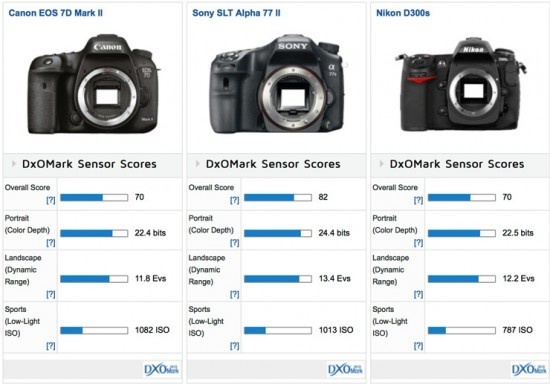 While I don't put a lot of stock in DXOmark, I don't think they're Nikon biased. Sony has one of the top 3 rated sensors, and 4 of the top 10. I think the biggest issue for Sony (until recently) is that they've been using an SLT setup, which is going to rob light from the sensor, which is probably impacting the Alpha line's scores. Also, every video I've seen that puts the Canon sensors vs Nikon Sensors (even back to the D700) have kinda verified that Canon's DR could use work. The shadows in Canon sensors are pretty weird once you start lifting them. It also depends on what criteria they use for weighting the scores. Actually the current "low light king" is the Sony A7s according to DXO mark so they don't put Nikon above Sony all the time. I think it boils down to Sony being the leader in sensor technology which helps out Nikon a lot. As far as Canon, they just seem behind the 8 ball with sensor technology but in all honesty it doesn't matter to anyone except the tech obsessed.